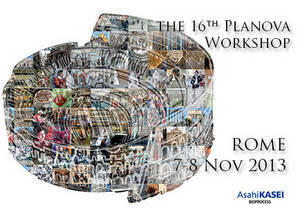 The 16th Planova™ Workshop was held in Rome on November 7 – 8, 2013. In this workshop, where the number of attendees was the largest in the Planova™ Workshop history, distinguished guests from more than 80 companies of 25 countries shared and exchanged their knowledge and views on recent topics in the biopharmaceutical industry. Fifteen presentations from guest speakers and staff of Asahi Kasei Bioprocess brought up the latest researches on biotherapeutic manufacturing processes, with focus on viral safety, process scale-up and bioprocess technologies. A panel discussion session led by various stakeholders of the industry, which was held for the first time at Planova™ Workshop, gave multi-facet and insightful perspectives of virus filtration technology. This session was well received by the audience. Updates of Asahi Kasei Bioprocess products, namely Planova, Planova™ BioEX, QyuSpeed™ D, BioOptimal™ MF-SL, Cellufine™ and Cellulose Porous Beads were also shared through poster sessions. You need to login to download past Workshop presentation materials. Please register if you do not already have an account.